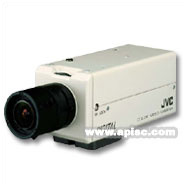 •1/3" High Resolution CCD with 380,000 Effective Pixels. 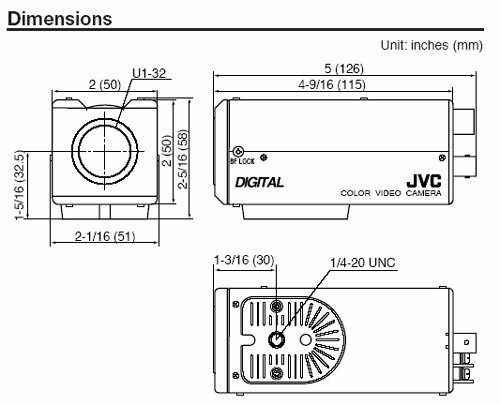 •540 TV Lines of Horizontal Resolution. •Easy Day/Night Function: Chroma ON/OFF. - Signal-to-Noise Ratio: 50dB (AGC OFF). - Revolutionary Integrated 10 bit Digital Signal Processor (DSP). - Automatic Electronic Shutter (AES) Mode ON/OFF. 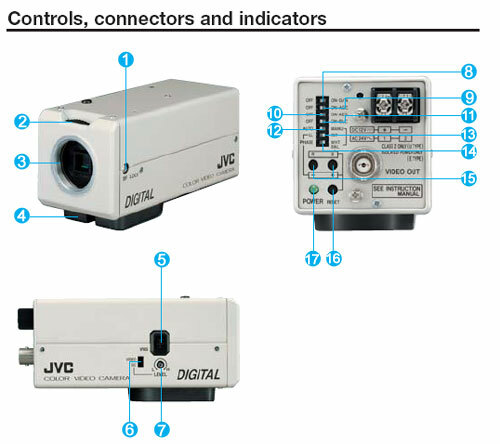 - Automatic Gain Control (AGC) ON/OFF. - Automatic Tracking White Balance (ATW) and Manual Modes. - Back-Light Compensation — ON/OFF. - Sync Systems — INT/Line Lock. - Supports Video/DC Iris Lenses. - Ultra Compact Camera Body. 1) BACK FOCUS locking screw. 2) BACK FOCUS adjustment and C/CS mount selector ring. 6) VIDEO/DC IRIS select switch. 8) D/N (Easy Day/Night) ON/OFF. 9) AGC (Automatic Gain Control) ON/OFF. 10) AES (Automatic Electronic Shutter) ON/OFF. 11) BLC (Backlight Compensation) ON/OFF. 12) WHITE BALANCE select switch.